If you play poker online and live in France, you are probably aware of a new law for online poker that start today, June 29th 2010. 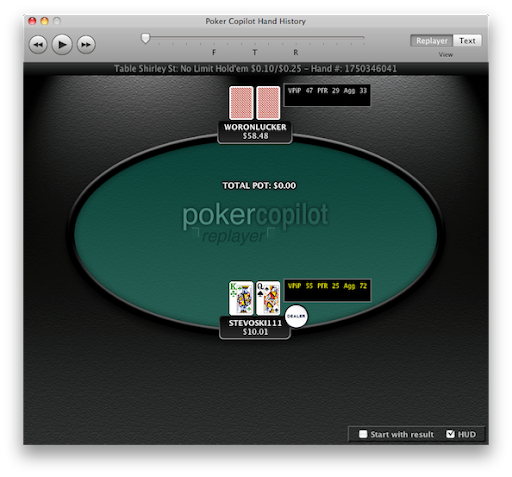 I’ve updated Poker Copilot to work with the France-only PokerStars client, also known as PokerStarsFR. You can download Poker Copilot 2.47 now to get PokerStarsFR support. In PokerStarsFR make sure instant hand history is set to English. You can use PokerStarsFR in French but the hand histories must be in English. In Poker Copilot’s menu bar select Tools -> Detect Casinos. This should automatically detect PokerStarsFR. If it doesn’t, quit PokerStarsFR and start it again. These instructions are also here. I’ll see if I can get support for the new Winamax client up soon. Stay tuned. Poker Copilot 2.46 is now available to download. You can now optionally have head-up display info in the Hand Replayer. Due to space constraints this works best if you have HUD labels turned off. The Hand Replayer can now optionally display each hand at the end or the beginning. This is called “Start with result”. I prefer to start with the result; that is, at the hand’s end, showing all mucked and shown cards. Some people like to hide the cards to help train themselves. More replayer improvements. Specifically, showing pot odds. When I was a greenhorn programmer I felt like a programming superhero. Every programming task seemed so easy. Until I started the coding. Need a form for entering customer addresses? No problems, I’ll have that done by lunchtime. Oh wait…it has to cope with addresses for people who live overseas with different address structures…? AND it has to cope with “care of” addresses…? AND some people in rural areas only have the town pub as their address with a note to ask the publican to “keep this under the bar until you next see Graeme”…? AND some people have multiple addresses because they spend six months of the year in Melbourne and six months in Brisbane…? AND we need to note if something we send to a customer comes back as “undeliverable”…? Instead of hours that takes weeks. Now every programming task seems too difficult. I’ve learnt to spend far more time reflecting and designing than coding. I assume any programming task is pretty close to impossible but that with some assumptions and constraints I can produce something kind of useful to some people. When coding I feel most of the time like I am overlooking big potential problems. Sort of like that feeling you have when you can’t remember if you turned off the oven. Which is why I love Patrick McKenzie’s Falsehoods Programmers Believe About Names article. It captures perfectly how difficult the most common – and seemingly simple – programming tasks can be. Computer programmers need things to be orderly. But human society is unorderly, full of exceptions and oddities. Poker Copilot 2.45 is now available to download. In the Players summary, if the “Only players seen recently” checkbox is checked, only players seen in the last 24 hours are shown. This was previously showing all players seen in the last month. This gives an enormous speed improvement to the Players summary for Poker Copilot users who play a lot of hands per month. Thanks to loyal customer Al for testing this. Cmd+W now closes the current window, as in most other Mac OS X applications. Fold to Three-Bet was sometimes calculated incorrectly. Thanks to loyal customer Jon for helping me track down this problem. Pressing a keyboard key while selecting a custom date no longer crashes Poker Copilot. Thanks to the JDatePicker team for fixing this so quickly after I reported it. Full Tilt Poker guarantee ticket wins are now handled correctly. Poker Copilot now no longer blocks your Mac from shutting down or restarting.